Flight Report - Multi Dowel Rokkaku kite nailed to the sky at sunset. This Multi Dowel Rokkaku kite design is the end result of about 3 prior versions, none of which really felt right. For example, the first kite had an overly complex bridle and a very narrow wind range in very light winds. If I published that design, there would be a few broken kites and unhappy customers! Even the current design is definitely for light winds but should pose no problems provided the wind is gusting to less than about 15 kph. A good design to take in case some other favorite kite fails to stay up, on the day. There was very little leaf movement on the way to the reserve. Just to avoid any chance of disappointment, the Multi-Dowel Sled was also in the boot. This design goes from 'very light' right up to the bottom of the 'moderate' wind range around 20kph. Despite the very meager breeze just registering on my face, I took a chance and started to rig the huge Rokkaku. Whether it was the cool temperature, or moisture, I don't know, but the dowel drums connecting the spar pieces put up some resistance to being moved. However, persistence paid off and finally it was time to sit the kite on its tail end and check the bridle knots. After attaching the flying line, a couple of short tows proved unsuccessful. No problem, this often happens on very light days! Finally a much longer tow on 30 meters (100 feet) of line did the trick. Even so, the air was so marginal for the Rok. A kite which weighs about 1.5kg. Its span is 2.4 meters (8 feet) and the height is somewhat more than that. Very slowly, it was possible to climb out to 60 meters (200 feet) of line. Once there, and with flying line under-foot, it was time to snap off a few photos and take some video with the Pentax Optio WG-2. Originally intended to be my KAP camera, it is now our general purpose camera since the little Samsung died some weeks ago. Flashes of declining sunlight came off the edge tape and plastic of the big blue sail, as the sun headed ever closer to the horizon. 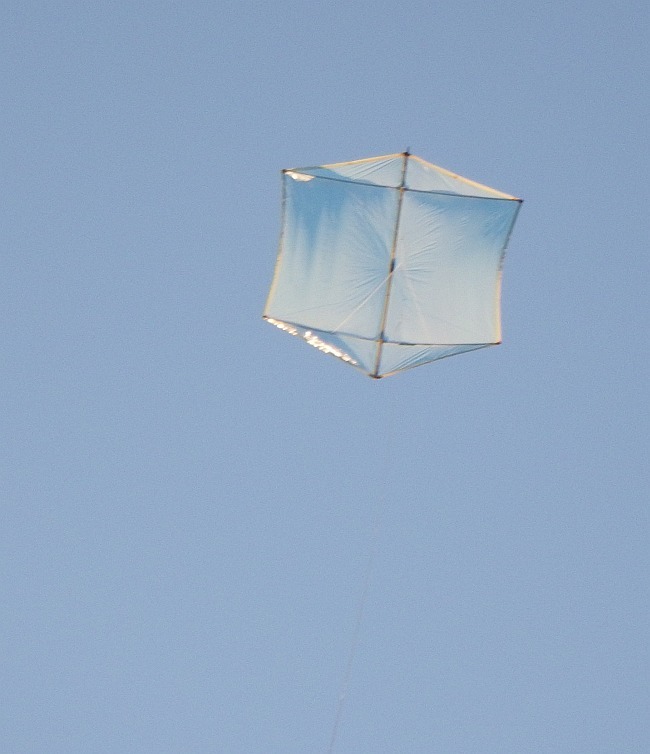 It was very pleasing to see the kite behaving itself after so much re-designing, mending and adjusting. That's one reason the e-books are such good value - you can avoid my mistakes and problems! 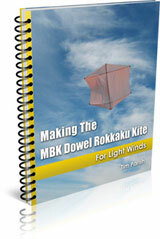 The e-book titled Making The MBK Dowel Rokkaku Kite contains plans and tips for making the Multi-Dowel version in this report. Astonishingly, this means the Multi Dowel Rokkaku kite would have stayed up there on a length of polyester sewing thread. For a few minutes, at least. I'm talking about the standard stuff that someone would darn your socks with, or sew on a button! Only a few days ago I had measured the breaking strain of this thread at around 1.4 kg - using the same set of spring scales. Some time later, moving across to grab something from the equipment bag, I noticed that the wind meter cups had stopped moving altogether. OK, so the breeze down low had really died off. A little later it was straightforward to climb the kite up to 90 meters (300 feet). It was relaxing to just watch it for a while, shifting ever so slightly in response to tiny changes in wind speed and direction. Really, the breeze was glassy smooth up there. On the way up, there had been just enough tension to whirl the hose reel around slowly but steadily as it let out line. After some minutes had passed I let the kite continue right out to 120 meters (400 feet), while it maintained a 55 degree angle from the horizontal. A guy in a ute (pick-up) was about to drive off, and stood for a while by the car door, watching the kite. Perhaps ten minutes later, I noticed him again. He had not driven off after all, but was now standing some meters from the car. Just gazing up at the Rok! So he must have felt some of the magic of flight too. By this time, the sun was about to touch the horizon and 3 airliners had climbed past, up around 4000 feet. Checking the line tension once more, it turned out to be exactly 2kg, and steady as a rock. A nice demo of wind gradient, illustrating how it was varying between the altitudes of 150 and 300 feet off the ground. Wind gradients don't stop at tree height, evidently! The Rok soon went vertical, then gradually started to nose-down under the influence of the long line hanging beneath. Horrifyingly, the kite was now entering a slow shallow dive, directly upwind. This was a bit of a test for my declining depth perception, with the kite almost straight above me! Now there was an ominous amount of slack forming in the line, and getting worse quickly. You don't need depth perception to notice that! More than a bit scary, it was, with visions of the giant kite draping the line over power-lines, or perhaps whacking into the side of a car on the road behind me. At least the situation was fairly predictable. I quickly pulled in all the slack, then scooted upwind a few meters to get the kite back into a normal flying attitude. This still left the kite at a very high line angle, but now the situation was under control. Gravity was now helping rather than hindering! After this drama it was a case of just continuing a slow and steady pull in, with the occasional stop to let the kite sink back a little. No more dive-bomber impersonations, thank you very much! Many minutes later the kite was finally close to the grass. For the last few meters, the wind speed was essentially zero, so the kite sank much quicker. At the right moment, it was easy to pull in line a bit quicker to flare and land the kite. Like a glider touching down on its tail-skid. Picking up the wind-meter a bit later, I accidentally cleared the display. So I just held it at shoulder height for a minute or so. The result was a 3.2 kph average with a gust to 3.9 kph. I'm loving the big Multi Dowel Rokkaku kite now, for those smooth, light wind days. Good for Winter flying, at least when there's no rain or wind squalls.